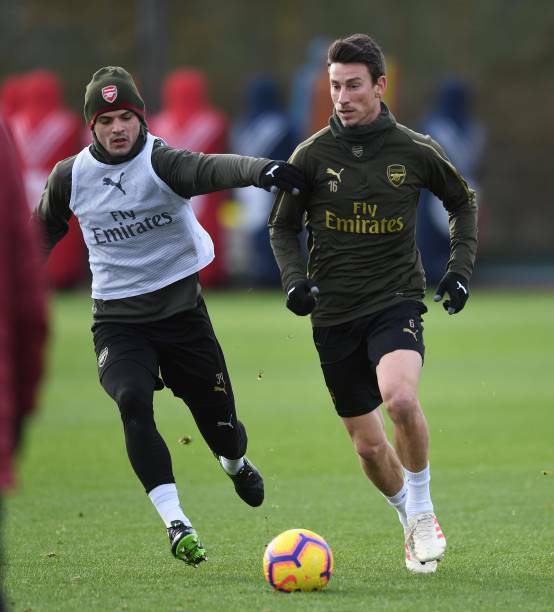 Arsenal midfielder Granit Xhaka and captain Laurent Koscielny are in a race to prove their fitness for Arsenal's Europa League quarter final first leg clash with Napoli on Thursday. Centre back Koscielny is being assessed over a bruised foot, while Xhaka is aiming to return after an injury to his groin. The Swiss midfielder was seen training alongside his team mates at Arsenal's London Colney headquarters on Wednesday as they prepare for the game. Arsenal captain Koscielny has endured an injury hit campaign, missing the opening months with a ruptured achilles tendon, and has had to sit out the last two games with the knock to his foot. Xhaka meanwhile has also missed the previous two league games including the 1-0 defeat at Everton on Sunday - but could return for Thursday's fixture. Arsenal are aiming to reach the Europa League semi finals for the second season in succession, but face a tough task against Serie A high-flyers Napoli. Other than Xhaka, Koscielny, and long term absentees Hector Bellerin, Rob Holding and Danny Welbeck, Arsenal manager Unai Emery oversaw training on Wednesday with the fully fit first team squad. Striker Pierre-Emerick Aubameyang looked in good spirits, pictured laughing as the Gunners went through their warm-up stretches. Midfielder Mesut Ozil looked more downbeat, with a snood covering his lower face. He was pictured throwing his coat in anger from the Arsenal bench after being substituted during the defeat at Goodison Park. The loss left Arsenal fifth in the Premier League, one point behind rivals Tottenham, as they aim to make a return to the Champions League next season.